On Earth as it is in Heaven: According to Galatians 4:26, Hebrews 12:22 and Ezekiel 28, Cities on Earth appear to have Idealized Versions in Heaven. The Bible depicts heaven as a glorious, idealized reflection of earth; and the earth is thus a dark shadow of heaven. Galatians 4:26 states, “But the Jerusalem that is above is free, and she is our mother.” Hebrews 12:22 says, “But you have come to Mount Zion, to the city of the living God, the heavenly Jerusalem. You have come to thousands upon thousands of angels in joyful assembly.” Jerusalem is not just a city on earth, there is a Jerusalem that is also in heaven. 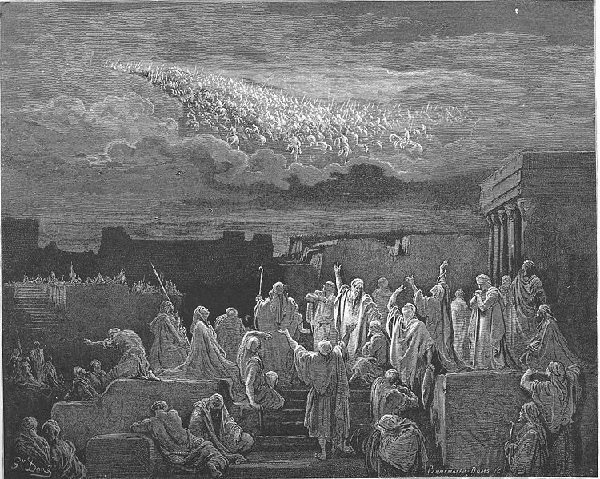 Descriptions of heaven in NDE’s resemble the new Jerusalem of Revelation 21. 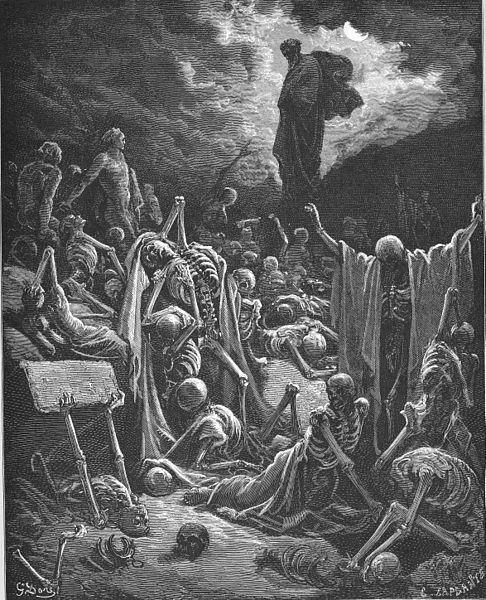 In the above vs. the Jewish exiles in Babylon are depicted as skeletons littering the ground. 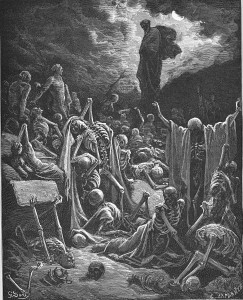 After seeing these skeletons transform into living people, Ezekiel is told that his people will go back to the Promised Land. [vi] Here one can see that the return of the Jews from exile is symbolically linked to the resurrection of the dead. In other words, these two events look as if they are symbols and signs of each other. I believe the return of the Jewish exiles is an earthly mirror, shadow or typological sign of the resurrection of the dead. Ezekiel 37:1-4 exemplifies what appears to be a typological link between some events in heaven and earth. Here the resurrection of the dead is symbolically related to the return of the Jews from exile. This occasional symbolic or typological linkage might also explain the fact that if a nation on earth is renewed by foreign conquest, its corresponding reflection in heaven sometimes appears to also experience some kind of an ambiguous renewal along with it. An historical example of this fact is found in 2 Maccabees 5:1-4. 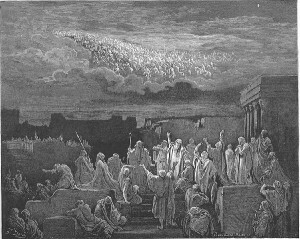 Here a vision of a war in heaven immediately preceded the Maccabean Wars of the second century B.C. 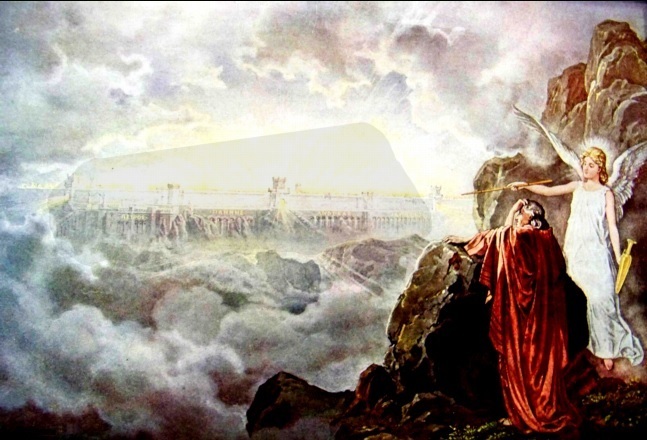 A similar vision was seen in the sky over Jerusalem in Iyyar of A.D. 66, the month and year in which Israel’s first century tragic war with Rome began. [vii] The concurrent destruction of heaven and earth is predicted in Psalm 102:25-26, Isaiah 51:6, Matthew 5:18, Matthew 24:35, Mark 13:31, Luke 21:33, Hebrews 1:10-12 and 2 Peter 3:10. The renewal of both realms as a new heaven and earth is also predicted in Isaiah 65:17-19, 2 Peter 3:13 and Revelation 21:1. This occasional typological or symbolic linkage between at least some events in heaven and earth might also help explain why Eden and the new Jerusalem are sometimes described in the Bible in ambiguous language that appears to point to both the Eden and Jerusalem on earth and the Eden and Jerusalem in heaven in Genesis 2-3, Isaiah 65, Isaiah 66, Revelation 21 and Revelation 22. See also Understanding the Garden of Eden and the Fall from an Old Earth Perspective. Could this ambiguity be a subtle sign that the Jerusalem in heaven is a glorious and idealized reflection of the Jerusalem on earth?